Western Fertiliser Technology Pty Ltd has developed the unique BLEND-Tech System of liquid fertiliser manufacturing units, widely sold in Australia and exported to many countries. Together with the portable BLEND-Tech Systems, formulation advice is provided to manufacture a full range of liquid fertiliser products, with ingredients sourced from Western Fertiliser Technology and locally for economy. The products are manufactured to be highly effective in increasing yields of crops, using thorough scientific techniques with a sound environmental focus and safety. 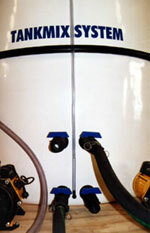 The 4500-litre and 6500-litre BLEND-Tech portable production units combines sturdy fibre-glass tanks with rapid agitation systems provided by corrosion-resistant Australian made centrifugal pumps, together with quality suction and delivery hoses fitted with cam-locks for rapid servicing. A 40,000-litre BLEND-Tech system is also available for large farms. The manufacturing units are provided with a high-efficiency dust removal fan, and are designed for easy, long-life operation. Purchase our 4,500-litre system and produce up to 12,000-litres/day (3 batches) of anyone of our BLEND-Tech products, BLEND-NS, BLEND-Cal, BLEND-Mag, BLEND-K and BLEND-Pop Up for huge savings. Contact Western Fertiliser Technology Pty Ltd for details of prices and availability of its technologically and environmentally advanced BLEND-Tech System.